The Australian property industry’s sentiment toward the future is overwhelmingly positive, belying the negativity conveyed by recent headlines – according to a new survey conducted by The Urban Developer. In a recent survey, conducted by The Urban Developer in partnership with Development Finance Partners, over 75% of respondents from across Australia responded that they were either "cautiously optimistic" or "very optimistic" about the next twelve months. 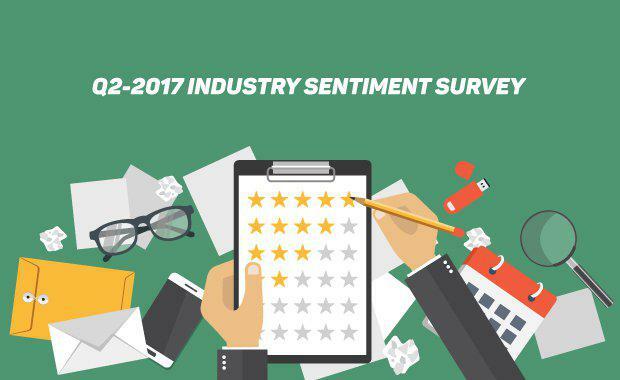 The Q2-2017 Industry Sentiment Survey surveyed over 1,000 respondents from all sectors of the property and urban development industry in Australia to better understand the prevailing attitudes towards various cities, sectors and disciplines. [Related reading: Apartment Building to Halve: BIS Economics; RBA Predicts Construction Slowdown]According to the survey, acquiring viable development sites (35%), obtaining development approvals (20%) and obtaining development funding (12%) were identified as the biggest challenges for developers across the country. Obtaining construction funding (37%) and securing finance for pre-sale purchaser settlements (37%) were identified as the biggest finance-related challenges facing developers. The results of the survey were released at The Urban Developer's recent Defensive Development event series held in Brisbane, Sydney and Melbourne. Experts from across property development, market research, finance and valuations joined Adam Di Marco, founder and publisher of The Urban Developer and Baxter Gamble, Managing Director of Development Finance Partners in a moderated panel discussion that covered the outlook for off-the-plan settlements, construction and purchaser funding, settlement valuations, construction pricing and site values. "Whilst funding conditions are getting tougher and access to credit is continuing to tighten, we are seeing that markets across the country are recalibrating from unprecedented levels of construction activity to more normal levels," Gamble told attendees in Sydney. "Smaller developers are feeling the greatest pinch of APRA's (Australian Prudential Regulation Authority) tighter banking controls which are starting to wash through the development sector and restrict new commencements. "According to Di Marco, the risk of an oversupply of residential dwellings in the major capital cities is contained to a number of "micro-markets" and the underlying fundamentals remain sound. "The population of Australia's capital cities continue to grow at some of the fastest rates in the developed world. Whilst we recognise the need to stabilise record levels of new supply, we also have major affordability issues, particularly in Sydney and Melbourne, which will only be exacerbated by a sustained period of low supply," he said. "We can't turn the tap off completely. We need to encourage a more sustainable level of new construction activity across individual markets based on a needs-based assessment of residential demand. We cannot simply cut our nose off to spite our face. Australia's next generation of home owners deserve a more sensible approach," Di Marco concluded.